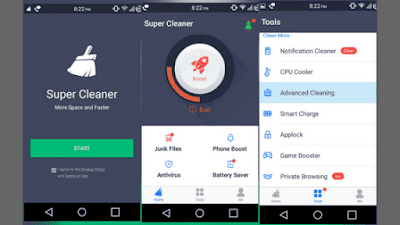 Best Junk Cleaner Apps for Android:In this article, we would like to tell us about some best android junk cleaner apps for your smartphones. These days so many junk files are getting created in our android phones and occupying so much space without our knowledge and due to this, we will be running out of space in most of the times. A junk file may be a small one and occupy less space but imagine when so many junk files are created then it will take a large amount of space in our android phone. And these junk files may be dangerous to our android phones too so don’t ignore them. We cannot find the junk files easily because they will be created with different extensions and will be created in the places where the android user face difficulties to find and delete them. For this problem, there are some simple solutions. Some of the app developers created some programs to detect these junk files and created some android apps to clean them and to free the space of the android phones. This android app is developed by 360 mobile security limited company. This app contains many useful options and provides Security, anti-spyware, virus protector, memory booster and clean master. 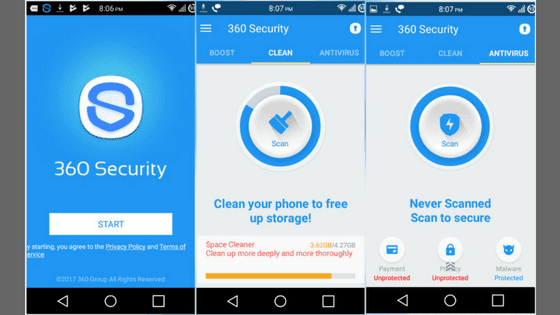 This 360 security is all in one app that protects you from the virus and boosts your memory and battery and remove junk files and cools your CPU. And it is one of the highest rated apps by the people. Highlights of the 360 Security App. Security & Antivirus: This app will scan all the installed apps and memory card content automatically and provides security to the phone. Lock screen: It automatically checks phones status when the phone is locked to provide optimization techniques. Privacy:This privacy and app lock prevents data on the device such as social media and images and gallery from falling into the wrong hands. If your android phone support fingerprint it has this option also. App manager: This app uninstall the apps and move the apps to sd card. WiFi security: Detect the current wifi connection to keep your phone safe. Junk file cleaner: This is a mobile cleaner app. It deletes all the junk files created in the device. Speed booster: Optimize the memory and it will speed up the phone. It will clean the ram and enhance the speed of the device. 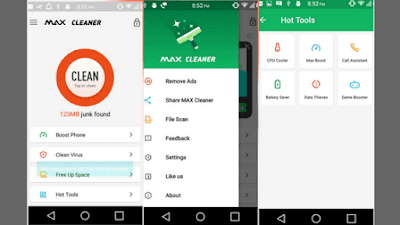 The Clean master app is also one of the best tools to clean the space and it has the antivirus to keep your phone safe and privacy to keep the data of the safe. It is also a highly rated app and the best one. Clean master main functions are listed below. 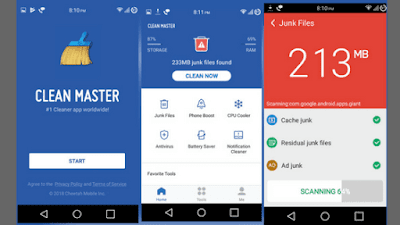 Junk cleaner: It clears the junk files which are created in the Android device and keep your phone safe. Private photo: This option keeps your photo safe by encrypting them and you can also hide the photos you like. Free Antivirus: It scans all the installed apps on your phone if found any it blocks the app to install on your device. WiFi security: Detect the current wifi connection that it is authorized connection or not to keep your phone safe. Battery saver: This app helps to save battery life and extend the battery life. Booster: Optimize the memory and it will speed up the phone. It will clean the ram and enhance the speed of the device. Ultra cleaner app created by hundreds of professionals and gave the best app to use. Includes some wide range of cleaning and security and optimizing features. It is one of the best in this business and the rated the high by the users. It has a good user interface and has very good features like the above apps. Junk cleaner: It cleans the junk files of the phone with just one tap and makes it a lot easier for the users. Cache cleaner: It cleans up all the useless application cache files and storage cleaner. Virus cleaner: It has a powerful antivirus engine that can remove all the antivirus that is present in your phone in a very efficient manner. And safeguard your phone from all the threats. CPU cooler: This app has another good feature called CPU cooler that reduces the CPU temperature and enhance the device performance. App lock: Protect the most sensitive information in your device with the extra passwords. Phone cleaner, Antivirus-max cleaner app: It is one of the highest rated free cleaner and the antivirus app for the android devices. It provides all the best key features to win the hearts of the users. This android app is providing Security, anti-spyware, virus protector, memory booster and clean master. 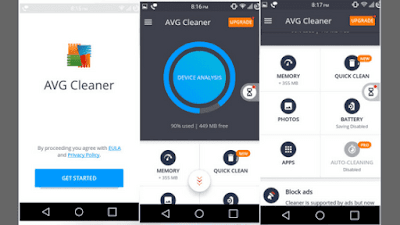 It is one of the most highly rated free cleaner and the antivirus app for the android devices. It provides all the best key features to win the hearts of the users. This android app is providing Security, anti-spyware, virus protector, memory booster and clean master. Antivirus:It scans all the installed apps on your phone if found any it blocks the app to install on your device. CPU cooler:This app has another good feature called CPU cooler that reduces the CPU temperature and enhance the device performance. Phone cleaner:It cleans the junk files of the phone with just one tap and makes it a lot easier for the users. App locker:Protect the most sensitive information in your device with the extra passwords. Phone Booster:Optimize the memory and it will speed up the phone. It will clean the ram and enhance the speed of the device. Junk cleaner:It cleans the junk files of the phone with just one tap and makes it a lot easier for the users. 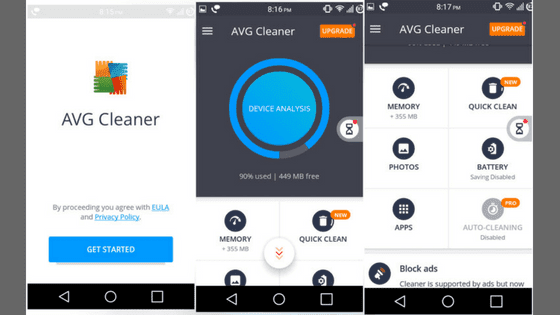 It is one of the top class android cleanings and boosting program with some cool features like antivirus, booster, app lock & manager and trusted by the millions of users. And this android app is also a highly rated one so try it guys. Phone Booster: Optimize the memory and it will speed up the phone. It will clean the ram and enhance the speed of the device. With this app your android device will run faster and smoother, it will store more data, and it frees up space by clearing all the junk and it saves the batter of the android device for a long time and also it is good smart device manager. Remove preinstalled apps: Remove pre-installed apps to save and boost performance. Get more space: Remove old files, uninstall apps, and delete the unwanted photos and videos. Improve performance: It uses its cleaner to clean cache and remove junk and identify the apps that will slow down your system. Longer battery life: This feature helps you to save the battery life of the device. Hibernate apps: It optimizes the background apps which are running and save the battery. Junk cleaner: Cleans all the junk files which are present in the device.